As we explored in a previous article, the overwhelming majority of 3D-printing plastics are made from fossil fuels. This means their production is associated with climate change and our species’ collapsing habitat. Additionally, new plastics may be in short supply at some point in the future. Fortunately, researchers worldwide are working to expand the portfolio of renewable plastic materials available to the 3D-printing industry. Most recently, a team of scientists from Kaunas University of Technology and Vilnius University in Lithuania demonstrated a process for creating photopolymer resins made from soybean oil- and lignin-based materials. In a paper published in the journal polymers, the authors described testing these materials to determine their suitability for replacing petroleum-based photopolymers. A prime candidate for the team was acrylated epoxidized soybean oil (AESO), an ultraviolet light or electron beam curable soybean resin. AESO is already industrially available with other chemistries, such as styrene, added to improve its mechanical and thermal properties. The researchers pointed out, however, that “these materials are petroleum-derived and harmful to health.” For this reason, they also explored mixtures of AESO with vanillin dimethacrylate (VDM) or vanillin diacrylate (VDA), made from lignin, “one of the most abundant natural polymers” on Earth. Key to the experimentation was that were no added photoinitiators or solvents, often found in traditional photopolymers, in their resins, making them more applicable to the fields of biomedicine, micro-optics and nanophotonics. 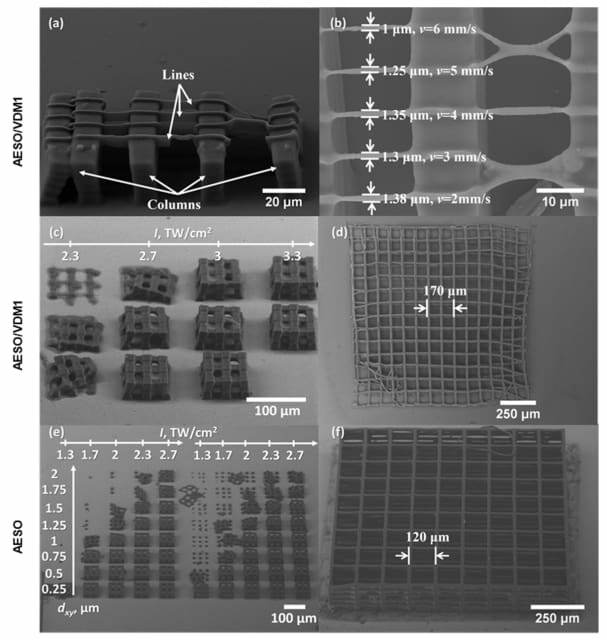 After concocting the 3D-printing resins made from combinations of these materials, the team used direct laser writing (DLW) 3D lithography to print microscale objects. You may be familiar with DLW used in nanoscale 3D printing, used in medical and optical research. The team 3D-printed microscale bridge objects using ultra-fast laser pulses. The AESO without VDM or VDA demonstrated a higher rate of cross-inking than when either of those materials were added. VDA was abandoned early on in the experimentation due to the fact that the gelling time was too high. VDM reduced the glass transition temperature, thermal decomposition temperature and compressive modulus of the printed objects. The authors ultimately concluded that VDM could act as a plasticizer for AESO.